On a Wednesday in October, the tumbledown Long Island bridge was closed. And the lives of the homeless and addicts who sought refuge and recovery there were thrust into disarray. This was their first Thanksgiving off the island. Here are four portraits, of those seeking help, and those who give it. 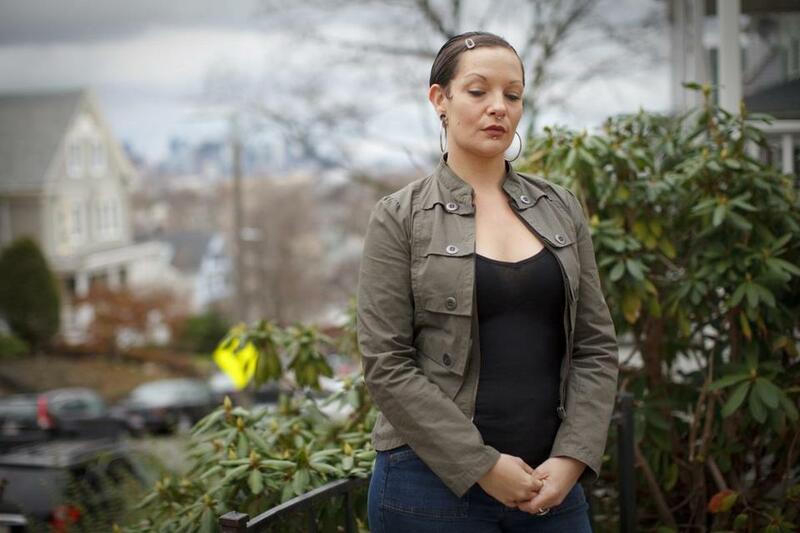 Tonya Williams, 47, is hoping to use a subsidy to move into an apartment in Dorchester. They’re in this predicament because the raggedy bridge to Long Island was shuttered in October. Williams, 47, used to live there, on that island, in a city-run shelter. 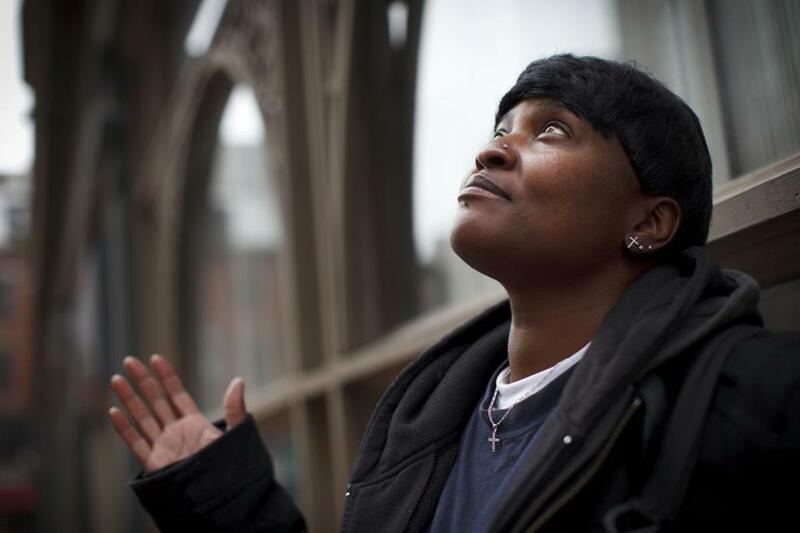 Now, she and 24 other homeless women are living temporarily at St. Francis House, a shelter on Boylston Street. They sleep on cots in the atrium and dining room. When she arrived, Williams, a veteran of 18 years on the streets, carried just a few clothes and a backpack filled with personal items and her Bible. She remains confident better days stretch ahead for the city’s homeless. “People now realize that a lot of people need a place to live,” she said. “I meditate on that,” she said. She qualified for a federal housing subsidy, and hopes to move into an apartment soon in Dorchester, where she grew up. “I’m looking forward to cooking Thanksgiving dinner there next year for my family and friends,” Williams said. Mike Andrick making his rounds in downtown Boston on Thanksgiving. At Boston’s Pine Street Inn, meeting the homeless where they are began about 20 years ago with a man named George. Sweet and sort of hopeless, a gentleman and an alcoholic, George was in his mid-60s when he turned up dead in a snowbank on Berkeley Street one cold morning. Today, that’s Mike Andrick’s job. 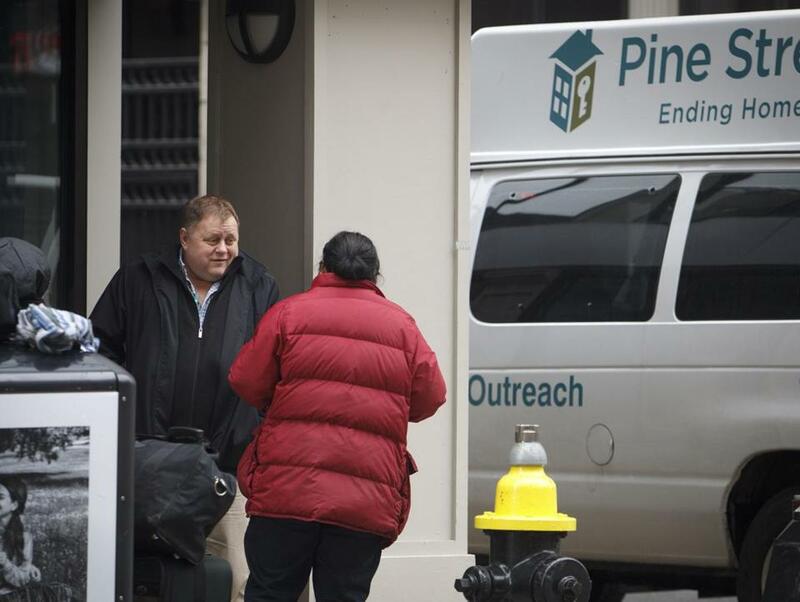 Director of outreach for Pine Street, Andrick supervises teams who scour the city night and day, in vans and on foot, treating the most acute homelessness where it lives. Outreach is lifesaving work, particularly overnight in the cold. It is also taxing — the team of about 10 gets lots of training, including for the tellingly named “compassion fatigue.” Teams identify and visit hot spots. They nudge people toward a warm bed by first finding people where they are, physically and psychologically. On Thursday, Andrick led tours for families who brought their children to volunteer at Pine Street’s Thanksgiving dinner. He showed them vans that would be delivering turkey sandwiches and hot cocoa, hats and gloves to people spending the holiday in parks and under overpasses. Some things are hard to explain to children. Putting problems like mental illness and substance abuse into perspective means starting with something relatable — some small trauma familiar to kids for whom the troubles of homelessness are mercifully foreign. 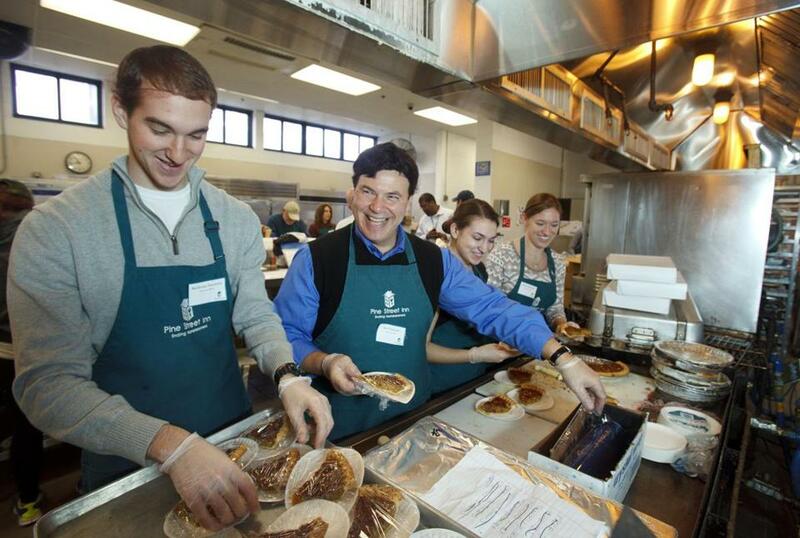 The Iannone family — Anthony (left), Joe, Paulette, and Kasey — were Thanksgiving Day volunteers at the Pine Street Inn. They have a system for making sandwiches, and in the busy kitchen at the Pine Street Inn on Thursday morning, the Iannone family of Whitman launched into action like seasoned pros. Anthony, 20 — the middle child, and the only boy — laid out slabs of bread and piled on sliced turkey. Then he passed them down the counter to Paulette, his 17-year-old sister, who slathered on cranberry sauce. Next in line stood Joe, their dad, who scooped on the stuffing. Finally, another sister, Kasey, 24, packaged each sandwich in plastic wrap and kept track of the tally. For years, the Iannones have volunteered here on Thanksgiving. This year, their help was needed more than ever. The homeless shelter, which normally prepares 2,000 meals a day, has served twice as many since the Long Island shelter closed last month. The sandwiches the family made were loaded onto a van and hand-delivered all across the city by outreach workers. As metal trays clattered and steam rose from dozens of turkeys — and Chubby Checker’s “The Twist” blared from portable speakers — the Iannones moved to their next task, slicing and plating pecan pies. At home, mom, Helen, and two other sisters, Jaclyn and Bridget, were preparing the family’s own feast. All of them felt lucky; helping at the shelter was one way to show it. “The difference between [homeless] people and us is just a wrong turn,” said Joe, 54, a salesman. He started chopping red peppers for Friday, when people would be hungry again. Misty Bergeron felt unsettled Wednesday night. She had a holiday pass from her recovery program at Shepherd House in Dorchester on Thanksgiving, her 36th birthday. Her disease told her, go for a walk. Just to get candy, or ice cream. That’s all. She prayed, then slept. When she woke up Thursday she decided, better stay put. She knows how lucky she is. This summer, after years of using painkillers and alcohol, she found herself homeless, without her children, wandering the streets of Worcester. “I felt like a failure — as a daughter, as a parent, as a productive member of society,” she said. So she checked into detox. Despite the statewide shortage of treatment beds, she got a spot at Joelyn’s Family Home, a halfway house on Long Island. When the island was evacuated, she spent a month bouncing among recovery programs before coming to Shepherd House. This place has helped her see a future: a barista job, her own place, ministry school. And so on Thanksgiving, she stayed in the beige triple-decker, set against a hill overlooking the city. She had turkey with the other women, who have become like family. But she ached for her daughters, who live with their grandmother — the bright, shy 16-year-old, an avid reader; the outspoken, affectionate 13-year-old, who draws anime — and for her sweet 6-year-old son, missing his two front teeth, in foster care now.